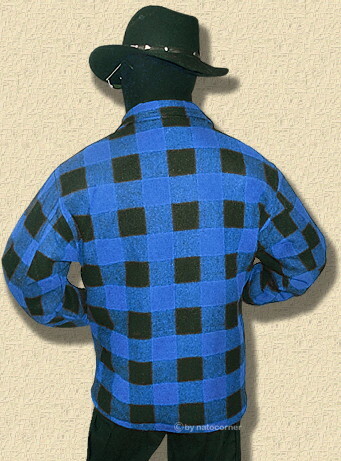 This lumberjacket was primary designed for swiss and canadian -forestry, lumbermen and woodworkers. simply to button, even with stout gloves. So it is small wonder that this jacket is similar to the genuine arctic-jacket N2B, which originally was made of a mixture of virging wool and synthetic fabric as well, according to material and processing. 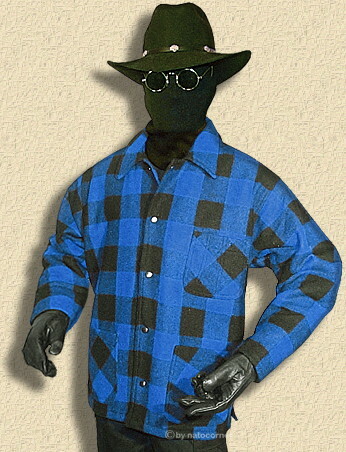 This mixture of virgin wool and synthetic fabrics, furthermore in use for the lumberjackets, is worked up incredibly steady and sturdy... perfect for all requirements in field and forrest. 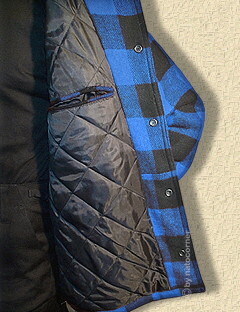 The inner lining of the jacket is made of nylon fibre, which is comfortably soft but extremely resistant. Another characteristic is the interior filling of polyamide, a thermal insulating hollow fibre, enduring highest straining with steadiness. Physical hard work and continuous movement stress the interior extremely. Filling of cotton wool fibre or downy feather could not stand this straining. The outer shell of the jacket is hardly destructable and the three twofold bordered pockets are absolutely resistant to tearing. The outer chest pocket is divided into three sections to preserve needful things such as inch scale, pencil, ball pen, or even sunglasses/ safety goggles, and the roomy inner breast pockets keeps safe purse and identity papers. 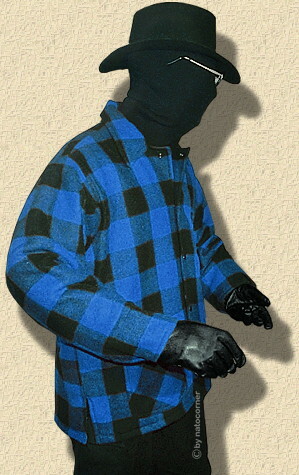 The button file in front as well as the sleeves are provided with solid press buttons (to close even with stout gloves). The lining fibre which is made out of microscopic small hollow blocks effects extreme insulation. Because the fibre is additionally worked up with silicone no humidity can be absorbed through capillaries effects. Nylon fibres are nearly indestructible. The inner lining also is sewn up and not simply put in. Unfortunately the production of these jacket was stopped a few years ago and a new edition is not known by now. That means stock, value new, and just as long as available.